Search for ‘Literature Festival’ on the internet and your engine of choice will no doubt list hundreds of thousands of results. As a writer then, how many do you attend? It wasn’t until I started getting serious about my writing – prioritising it and aiming for publication – that I actively sought out events featuring authors and other creative professionals. And I have to say, now that I know what’s out there, I feel spoilt for choice. In 2013 my parents highlighted a number of activities going on in my home town of Huddersfield that they thought I’d be interested in. They were advertised under the banner of the Huddersfield Literature Festival: something I’d never heard of before. Suddenly, I was hooked. I must have attended half a dozen or so different events – some that cost a small amount and others that were free. And, during one event I met the Festival Director. Michelle’s passion for the Festival shone through and her enthusiasm was catching; “I’d love to help out next year,” I offered – neglecting the fact that I wasn’t yet fully recovered from my CFS/ME. But that didn’t stop me, and before I knew it I’d had a few exchanges with Michelle and discovered that their committee was in need of someone familiar with Arts Council funding applications (my role at The Manchester Museum is supported by AC). For the last two years Huddersfield Literature Festival has successfully raised increasing funds to support the Festival from the University of Huddersfield, Kirklees Council, Arts Council and local sponsors. Not only that, but I was also able to offer my skills as an Evaluation Officer (another role I used to have at the Museum) and my training in areas of Child Protection and Risk Assessment. I’m not sharing all this to demonstrate how generous and skilled I am – but to remind those out there that there are ways of getting involved in Literature Festivals other than being one of the authors. Whatever skills you have I’m pretty certain that such festivals can make use of them whilst also developing your experience and providing you with some potential contacts for when you are published. Not to mention how great it would look on a writing C.V. I won’t lie – it takes time and, depending on how active a member you are, it can also be hard work; as a result it does take your attention away from writing. Yet, the benefits (in my eyes) far outweigh the efforts I put it. Not only can I be proud of contributing to a cause that encourages people to read and write, provides opportunity to local, upcoming practitioners and writers and brings revenue to the area; but I get to meet authors, chat with them and even make suggestions of who we might try and attract for the future. Last year I was fortunate enough to sit next to the delightful David Barnett, whose novel Gideon Smith and the Mechanical Girl I had been intending to read for far too long! I, of course, rectified this immediately and I’ve now become a huge fan of the Gideon Smith novels and the various short stories David has written to accompany them. On top of all this, I’ve been inspired to get on with my own work because in meeting all of these authors and agents and editors I’ve begun to realise that my dream is achievable. It doesn’t just happen to other people; it happens to people I’ve met and people I like; some of whom, it seems, have become supporters of my own – such as the lovely Rosie Garland who I met at the Museum whilst she was appearing in the Manchester Literature Festival. I’ve been to so many of her events now she knows who I am and often asks how I’m getting on in my writing. Sometimes I even get a personal invitation to her gigs – which is a wonderful touch, making Rosie one of my favourite authors of recent times. I might never have had such fortunate opportunities had I not taken an active interest in my local literature festivals, nor volunteered myself to help out where I could, when I could, how I could. It’s an immensely rewarding experience that makes me eager to complete my novel so that I might finally be able to take part in one myself, as an author – just to see things from the other side. 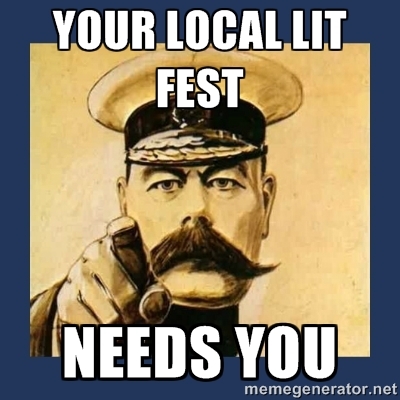 To find a UK Literature Festival near you, check out this handy list.